Waterfalls are one of the biggest attractions of the Poconos in the spring and summer months. There’s just something about the constant rush of water over rocks that’s mesmerizing! You don’t have to settle for seeing pictures of these rushing streams cascading over boulders. You and your kids or grandkids don’t have to look at them from inside your car, either. In the Poconos, you can get out and feel the spray on your faces! Here are just a few of the falls you can easily access in the region. 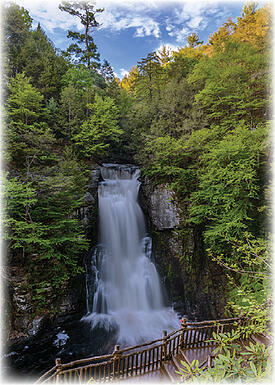 Bushkill Falls is often described as “The Niagara of Pennsylvania. This unique series of eight waterfalls, nestled deep in the wooded Pocono Mountains, is accessible through an excellent network of hiking trails and bridges that give you fabulous views of the falls and the surrounding forest. Dingmans Falls is the second highest falls in the state, with a plunge of 130 feet. In heavy spring runoff, there is no way to get to the end of the boardwalk without getting drenched by spray. The boardwalk trail passes by a thin horsetail cascade called Silverthread Falls. Located off Rt. 209, 2.5 miles south of Milford, Raymondskill Falls is the tallest waterfall in the state and features two viewing platforms: one near the head of the falls, and one at a large step that divides the upper two drops from the lower. The trail leading to the top of the falls is dramatic as the water cuts through the escarpment. The trail comes out to Raymondskill Road. Across the road a trail continues up the creek to Hackers falls. Of course, not every hike has to end at a waterfall. If you’re looking for something a little different, you might want to try a self-guided walking tour around one of the historic areas. Here’s one suggestion to get you started. Take a self-guided tour of the Jim Thorpe historic district that dates back to 1816. This picturesque town has an eccentric past comprised of millionaires and miners, money and misery. The haunting sound of church bells and steam whistles will stay with you when you leave.